Check here for our latest upcoming activities! On Saturday, November 17th at 2:00pm Living Hope Church is heading to Boomers in Fountain Valley for a couple of rounds of Mini-Golf and some snacks! Bring $10 for golf, and more for food! Boomers is located right off of Magnolia and the 405 Freeway. For more information, visit their website at http://www.boomersparks.com/fountainvalley. See you there! 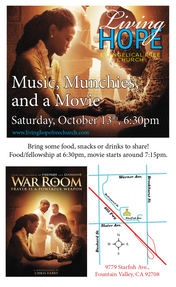 Join us at the Living Hope Fellowship Hall for War Room movie on October 13th, at 6:30pm. 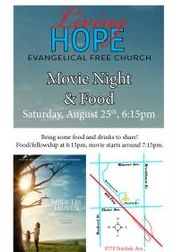 Join us at the Living Hope Fellowship Hall for Miracles From Heaven movie on August 25th, at 6:30pm. 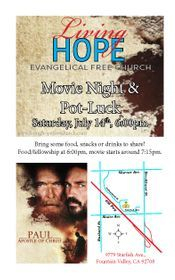 Join us at the Living Hope Fellowship Hall for Paul: Apostle of Christ movie on July 14th, at 6:30pm. 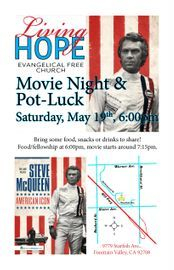 Join us at the Living Hope Fellowship Hall for American Icon movie on May 19th, at 6:30pm. 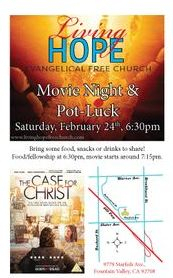 Join us at the Living Hope Fellowship Hall for The Case For Christ movie on February 24th, at 6:30pm. Coming in fall 2018, join Living Hope Church for a night of Art and Theology where we all learn how to paint a picture together while learning about the relationship theology and art share! Do not miss this! Please Register for this event, and bring $5 for participation, to pay for your canvas and paints. PLEASE BRING: An apron, clothes you don't mind getting messy, a spirit to learn, a positive attitude, and the joy of the Lord!